acrosser Technology Co. Ltd, global professional industrial and Embedded Computer provider, announces the new Atom series solutions which include AMB-D255T1 Mini-ITX industrial mainboard and AMB-N280S1 fanless 3.5-inch single board computer. AMB-D255T1 is equipped with an Intel D2550 Atom processor. AMB-N280S1 is equipped with an Intel N2800 Atom. Both have a 5~7 year product warranty. AMB-D255T1 features powerful graphic performance via VGA and HDMI output, one DDR3 SO-DIMM socket, mSATA socket with USB signals and SIM slot, and a +12V DC jack for easy power input. AMB-D255T1 also provides complete I/O such as 4 x COM ports, 6 x USB2.0 ports, 1 x GbE RJ-45 port, 1 x SATA port with power connector. AMB-N280S1 has a variety of I/O ports, such as 5 x serial ports (one is RS-232/422/485 selectable), 4 x USB2.0, 2 x GbE RJ-45 ports, and one Mini-PCIe expansion. 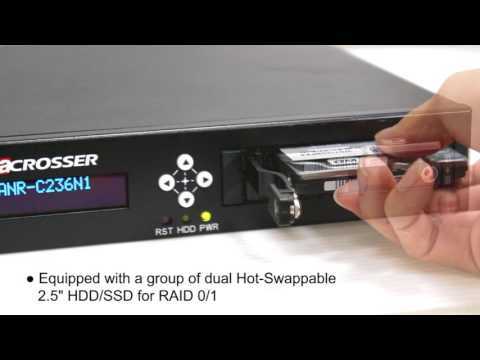 It also offers 1 x SATA interface and power connector for customers desiring large storage capacity. AMB-N280S1 has one HDMI port and one VGA output and can support two maximum resolution displays of 1920 x 1200. It also offers a 18-bit LVDS interface for small size LCD panels. Acrosser is providing a special price for these two boards to make them available for customers sooner. Please contact your local sales for more information. This entry was posted in Embedded Computer, In-Vehicle Computer, Industrial PC and tagged embedded system, in vehicle pc, Industrial PC. Bookmark the permalink.